Livorno is a port on the coast of Tuscany in central Italy, on the Tyrrhenian Sea. Though not generally seen as holiday destination, Livorno has many travellers passing through or spending a few hours in town as it features on cruise itineraries and is the departure point for ferries to the islands of Corsica, Elba and Capraia. Although overshadowed by nearby attractions such as Pisa and Florence, Livorno is a pleasant enough place to spend a short time and it is a practical base if you have an early or late ferry. The port's English name, dating back to a time of merchant ships and Grand Tourists, is Leghorn. 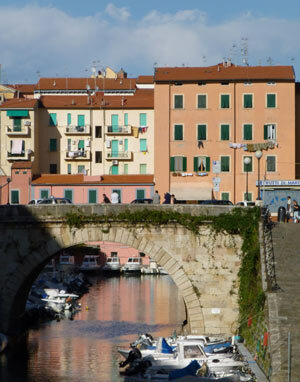 Livorno doesn't have the long history or quaint medieval centre of a typical Tuscan town. This is because it was purpose-built as a port in the 16th century, designed as an ideal mercantile modern city. Its harbours, fortresses and waterways are testament to the functional planning of the town, while a variety of churches record the presence of merchants from many countries. Nowadays Livorno is a busy city with, in places, a vaguely down-at-heel air, but a bit of exploring soon reveals the town's more interesting sights. As Livorno is not a particularly obvious venue for sightseeing, a good first stop is the tourist information office on Via Pieroni, between Piazza Grande and Piazza del Municipio (housed in a building like a small shopping mall). Here you can obtain a map, timetables for boat trips and additional information about local attractions. The most interesting part of Livorno to explore is the 17th-century "New Venice" district, the Quartiere Venezia, or Venezia Nuova. Surrounded by canals, this was a rather grandiose conception where merchants' houses and warehouses were built with water access. Nowadays there are a few interesting shops, restaurants and bars in this area, where plenty of locals still keep their boats moored. Some of the town's grander architecture can be seen along Via Borra, which runs through the heart of this unusual district. A festival called Effetto Venezia takes place here each summer. The Scottish writer Tobias Smollett died in Livorno in 1771 and is buried in the town's historic Protestant cemetery. This is usually only open by special arrangement, but you can peer through the gate or over the wall to see the clutter of stone monuments filling the leafy graveyard. Smollett's Journeys Through France and Italy (available on the Project Gutenberg website) is a very entertaining read and full of tales of villainous innkeepers. The cemetery (Cimitero Inglese) is alongside Via Verdi, with its gateway on a side-street, almost opposite the junction with Via Adua. Other sights include the 'old' and 'new' brick fortresses, both dating to the 16th century and encircled by water - the walls of the Fortezza Nuova now enclose a park, closed in recent years. The town's cathedral was rebuilt after Second World War bombing; inside is a painting by Fra Angelico, displayed in the Cappella del Santissimo Sacramento. Other historic churches are scattered around the town. Livorno has a city art gallery, the Museo Civico Giovanni Fattori, housed in 19th-century Villa Mimbelli, and also an aquarium. If you are spending time in Livorno, it may be worth purchasing the Livorno Card which includes local transport and museum admission; details can be found on the council website. A boat trip around Livorno's canals (fossi) is an entertaining way to see the town; tours run several times a day and some include extra attractions such as a visit to the market. Sights along the canals include the market and churches including the lovely but crumbling Dutch-German church, the Chiesa degli Olandesi (near Piazza Cavour). Via Grande, a street lined with modern arcades, cuts through the centre of Livorno, from Piazza della Repubblica to the Porto Mediceo, and is a useful place for a spot of high-street shopping. Bus number 1 from the station follows this route. 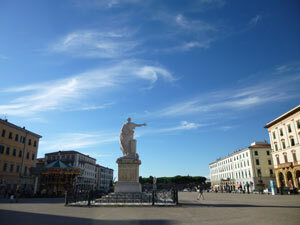 The wide Piazza della Repubblica has views across the canal to the Fortezza Nuova, and is a majestic open space. After touring the centre of Livorno, visitors can enjoy a walk along the seafront to the south of the town centre, beyond the port district, where the seafront road passes parks, bathing establishments and little harbours. Livorno has a choice of cheap and moderate restaurants where you can eat seafood and traditional Tuscan cuisine. The canal area is a good place to start - options include the informal Sugo at Via Borra 51. Livorno has a large purpose-built covered food market, open Monday-Saturday mornings, where you can find local produce. The grand 19th-century market building stands alongside a canal and is a picturesque as well as lively sight. Specialities to try in Livorno include ponce, a drink composed of coffee and rum, and cacciucco, a hearty local seafood stew. If you fancy a short trip from Livorno, Pisa is in easy reach by train (less than 20 minutes away). There are several appealing little resorts along the coast, and another attraction is the religious sanctuary at Montenero, close to Livorno. The closest airport to Livorno is Pisa Airport, which is served by international flights with British Airways and other airlines. The airport is extremely close to central Pisa and connected by both buses and trains. To reach Livorno, you change trains at Pisa Centrale station; the entire journey only takes around 30 minutes including the change. Livorno Centrale station is some way from the centre of town. Bus number 1 runs from outside the station through the heart of Livorno, including stops at Piazza della Repubblica, Piazza Grande and close to the Porto Mediceo. You can buy cheap bus tickets from kiosks and news-stands in the station and around town; validate your ticket when you board a bus. 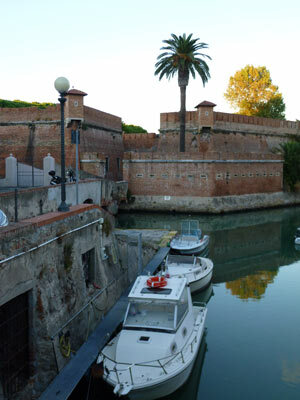 Once you have reached the centre of town, Livorno can be explored on foot. Cruise ships usually lay on a shuttle service to Piazza Grande or Piazza del Municipio for their passengers. Ferries run by several different firms depart from Livorno. Toremar run daily ferries to the island of Capraia from the Porto Mediceo, near the centre of Livorno, at the end of Via Grande. The little prison island of Gorgona can be visited on pre-booked tours organised by the Cooperativa Parco Naturale Isola di Gorgona. Moby Lines operate ferries to Sardinia (Olbia) and to Corsica. Corsica Ferries e Sardinia Ferries are fairly self-explanatory. Grimaldi Lines run to Barcelona and Tangiers. These mostly depart from the Stazione Marittima, close to the centre of Livorno - check each company's website for maps and details. Large cruise ships may use industrial docks further from the centre of town, with a shuttle bus connection, though smaller vessels sometimes berth at the Porto Mediceo. If you are touring around Italy, Livorno links up easily with La Spezia and the Cinque Terre, with Florence (an hour and a half by train) and with islands including unspoiled little Capraia. Livorno has a choice of places to stay with hotels in different locations to suit travellers' needs. If you are spending a night in town before catching an early ferry, convenient hotels include Hotel Gran Duca (barely five minutes from the Porto Mediceo) and the good-value central Hotel Europa Parking. Hotel Stazione is near the railway station, a bus or taxi ride from the town centre and the ports. If you're looking for more than a practical overnighter, the NH Grand Hotel Palazzo offers sea views and smart surroundings.